Rancho Guejito Corp., enmeshed in a web of controversy over efforts to develop a big chunk of the 23,000 acres it owns between Route 78 nearly to Route 76 in North County, drew top billing at last night's San Diego County Taxpayers Association banquet last night, but some local politicos and a non-profit media outfit managed to grab a piece of the spotlight. The real estate giant was joined in sponsoring the bash by SDG&E and various other lobbyist employers - including paramedic contract hopeful American Medical Response; Bridgepoint Education; and Walmart. The evening featured musical parody videos, one of which starred Democratic San Diego city councilman Todd Gloria and GOP ex-councilman and failed mayoral candidate Carl DeMaio, along with a possible DeMaio 2014 target, freshman Democratic Congressman Scott Peters, as well as police chief William Lansdowne and others. 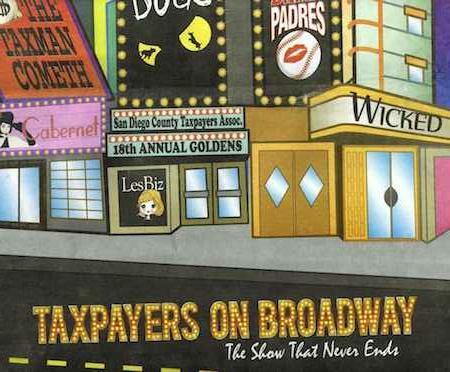 A "gold" sponsor of the event, billed as "Taxpayers on Broadway," according to the program, was the Voice of San Diego, a non-profit online news operation, which took home the association's annual media watchdog award for coverage of Poway's school bond scandal. Public Policy Strategies, the lobbying boutique founded by consultant Tom Shepard, who serves as mayor Bob Filner's political guru, was listed as a platinum sponsor. Among other clients, the firm represents SDG&E. Another parody video released by the association featured a send up of the adversarial relationship between Democrat Filner and the GOP's Jan Goldsmith. The real Goldsmith had earlier appeared as a dancing chorus boy in a promotional video for the banquet. The annual event drew many of the city’s most prosperous super lobbyists, including Paul Robinson and Alan Ziegaus, whose firm Southwest Strategies has represented Fox Sports in the battle over local Padres coverage and marijuana vending machine maker Medbox, Inc. Retired lobbyist Ben Clay was also present. photog921 May 10, 2013 @ 6:02 p.m.
Rancho Guejito seems to be throwing a lot of money around lately. They must have more up their sleeves that even what has already been reported. Good reminder. photog921 May 10, 2013 @ 6:03 p.m.
Is the Taxpayers group for men only? The videos I've seen (3) are exclusively male. Maybe women elected officials had better things to do.